One of the differences between HP’s laser-class printers and those built by some other companies, such as, say, OKI Data and Brother, is that, while they tend to cost more and cost more to use, the former multifunction (print, copy, scan, and fax) LaserJets are also more stylish, as well as more advanced in certain types of printing technologies. Unfortunately, though, you pay for the style and new innovations — both in terms of the cost for the machine itself, and in this case, the per-page cost of toner. 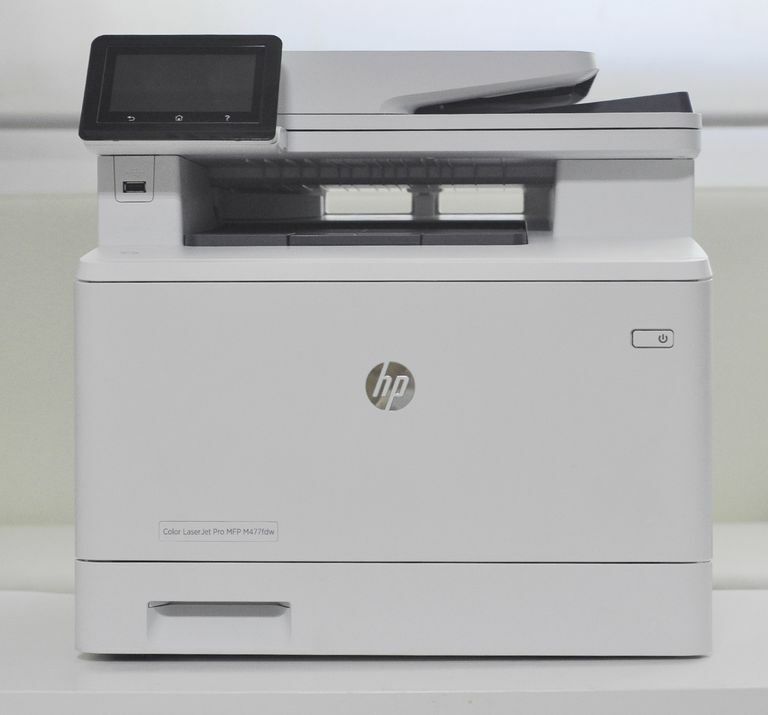 There’s a lot to like about the topic of this review of HP’s LaserJet Pro MFP M477fdw. It prints well; it’s loaded with features, and it has a relatively low black-and-white cost per page. Its color cost per page, or CPP, though, is far too high. Granted, most small businesses and workgroups print many more monochrome pages than they do color, but as you’ll see in the Cost Per Page section, this model’s Color CPP is high enough to dissuade color printing altogether. The MFP M477fdw measures 16.3 inches tall, by 16.8 inches from side-to-side, by 25.7 inches from front to back, and weighs 59.1 pounds. That’s far too much printer to sit next to your PC on your desktop. The good news is that this MFP comes with just about every feature you can think of, including a 50-sheet auto-duplexing automatic document feeder, or ADF. In fact, not only can it scan both sides of your originals without user-intervention, but this is a "single-pass" ADF, meaning that the scanner can scan both sides of your originals at the same time. In other words, it has two scanning mechanisms for scanning two pages, each side, simultaneously. It also has a spacious and easy-to-use 4.3-inch color touchscreen for configuring the MFP, or for facilitating PC-free, or walk-up, options, such as making copies, scanning to a network drive, or scanning to and printing from a number of cloud sites. Other mobile connectivity options include Wireless Direct, HP’s equivalent to Wi-Fi Direct, and Near-Field Communication, or NFC. The other more basic connectivity options are Wi-Fi, Gigabyte Ethernet, and USB. The feature list goes on and on. As we said earlier, it’s not missing much. This MFP is part of HP’s JetIntelligence technology, which reportedly increases both speed and print quality. HP rates the M477fnw at 27 pages per minute, or ppm, but keep in mind that these pages consist of unformatted text in fonts default to the printer. Even so, we got decent speeds, just over 9ppm on the mixed formatted text, graphics, and image-laden business documents. HP’s LaserJet models print well. We liked everything we printed on this model, even photos. Granted, it prints photos at the high end of laser quality, which isn’t up to photo inkjet standards, but good enough for most business applications. Paper handling, too, wasn’t bad. You get a 250-sheet main drawer, as well as a 50-sheet override tray for printing on media other than your default, quickly, without having to empty and reconfigure the input drawer. In addition, HP offers a second 550-sheet cassette on its site. Perhaps this MFP’s most disappointing aspect is its color cost per page, or CPP. It’s monochrome CPP of 2 cents isn’t too bad, but well under 2 cents is more appropriate for a relatively expensive MFP like this one. And it’s 14 cents for color pages is far too high for a volume laser printer. If you plan to print much color at all, you’ll want to find a machine where the CPP isn’t this lopsided toward black-and-white printing. This is an easy call. If you plan on printing a lot of color documents, look at other printers. If not, this is a decent high-volume MFP.